It has been a crazy year,Â than again every year is a crazy year wouldn’t you agree?Â What has been really awesome is the fact that it is going to be 2011 and internet network marketing is still growing strong.Â Many more people are starting to realize that the money in this industry is in the systems and tools used to build a network marketing business. While having an awesome product is indeed important it. Having the right mindset and proper tools to market online is more important. If you have been online for any length you will know that you need some sort of system to help you find prospects. At least that is what you are told.Â You may be wondering what are internet network marketing systems. These usually consist of nothing more than a team oriented lead capture page , autoresponder system and some team training thrown in for good measure. The marketing techniques are really the same since I have been marketing online which has been a little over 10 years. Some stuff has changed but not much. Take Google adwords, it use to be the bread and butter for many marketers, until Google slapped the crap out of people.Â So peeps moved to facebook ppc advertising. Same thing as google but no slaps as of right now. You don’t really need a system to build your business because you are your own system. But you do need a good lead capture page (easily created by yourself with the right tools) and you need a good follow up email series, again easily created by you. The one thing that is not easy to come by is a good sponsor, that is something you are going to have to shop around for. A good sponsor will help you learn the real skills you need. I am sure you have heard this before but it is true. The most important trend happening in the internet network marketing world for 2011 is the fact that more and more people are starting to realize just how important blogging is.Â Friends without a doubt if you want to be competitive online you will absolutely need to blog. 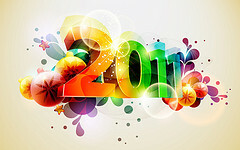 Make 2011 a great year and start it off right by blogging. People everywhere are getting ready to make their New Years resolutions. What do you plan to do differently this year, than you did last year? Do you see any new trends developing in 2011 you would like to share with us? I would love to hear what you think. Great post here, Larry. I’m not much into the whole network marketing thing, but I can see that this post is a great resource for people who are. Nicely done! I hope you had a great new year and have an awesome 2011! Great set or resources. With any form of success it is always good to learn from those who are successful. Absolutely, right. A lot of bloggers will do benefit from this post. Realizing this year 2011, I am sure that a lot of internet marketers will focus on this kind of career. As long as we have the internet, I am sure that opportunities for online marketers will be available, they’ll just have to use their resourcefulness. Hi Melz, thanks for stopping by. You are right one really cool thing about wanting to market online is the fact that there are tons of different opportunities. That means there really is something for just about everyone. Being an expert in Network Marketing what you’ve written about internet network marketing is very much taking place at present Larry. Though late I’m really glad that I came across your blog and I’m trying to explore your blog because I find your articles completely awesome, completely informative. Keep it up!